Are you a Planner who thinks about design? Maybe you are a designer who obsesses about the business impact of your designs. Or you might be an Information Architect who thinks about motion, transitions, multimedia, and uses tools like storyboarding and visual scenarios. Or how about a Developer who comes up with the “big idea”? If you haven’t noticed, creativity is evolving. The perception of creativity itself is slowly but surely transitioning into a mutated and adapted life form. In the traditional world, a “creative” person usually meant someone with savant-like talents excelling in a specific creative discipline defined by fairly concrete parameters. Copywriters wrote copy. Art Directors directed art. There are still talented visual designers who can make anything look good. Brilliant copywriters who can come up with that magnificent tagline which stops you in your tracks. And don’t forget about smart, methodical Information Architects who devote their existence to usability and being an advocate for the end user. These skills, talents and abilities are needed—no doubt about it. But what’s also needed is the evolution of them—the next iteration. But what does this look like? An Information Architect who completely grasps Human Computer Interaction but can also think fluidly—can do things like rapidly create prototypes, facilitate user testing, understand visual design and occasionaly write copy. This kind of individual possesses a multi-dimensional creative brain that has evolved over time. With consumer behavior evolving toward a more empowered status—the definition of creativity has shifted from one-dimensional skills to a four-dimensional type of creativity that blends logical thinking with creative problem solving. 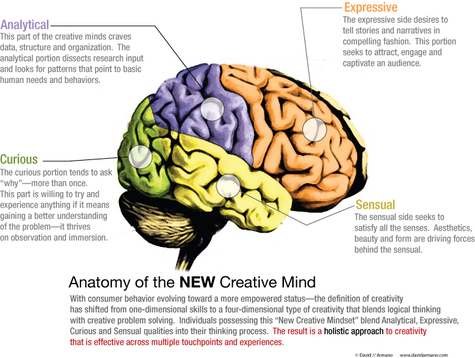 Individuals possessing this “New Creative Mindset” blend Analytical, Expressive, Curious and Sensual qualities into their thinking process. The result is a holistic approach to creativity that is effective across multiple touch points and experiences. Can an Information Architect embody this kind of mindset? What about an Account Director? I think as human beings we are all capable of thinking like this. But as designers, communicators, marketers and creators of experiences—for us, it’s even more critical to become multi-dimensional creative thinkers and problem solvers. I’m not the only one talking about this. 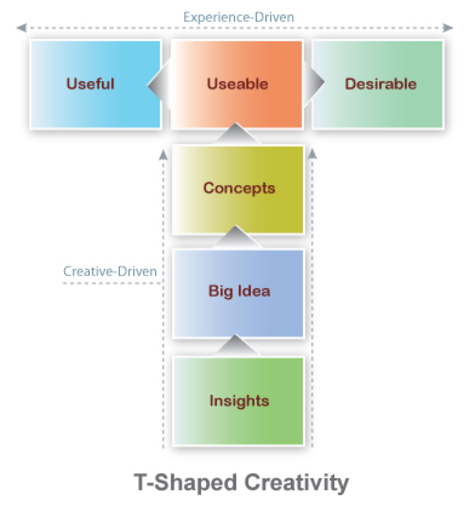 Tim Brown from IDEO evangelizes “Design Thinking” and “T-shaped People”. Both principals are related. Design Thinking encourages Designers to think past aesthetics and design simple solutions for complex problems. T-shaped people have a core competency but branch out into other areas and can do them well (thus forming a T). And of course there is the new kind of collaboration that comes with this—where we combine people with diverse skill sets who often times speak very different languages but need to come together to make their collective and diverse skills work together. This kind of collaboration sounds easier than it actually is, because when you get a few T-shaped people together, they tend to “play in each other's sandbox”. Translation? Ego’s need to be unlearned. In short, it’s not just about T-shaped people. It’s about how we work together to create something that people will want to use, experience and ultimately—compel them to take action. I don’t think that any of this is very new. It’s been happening for a while. In my time spent at agency.com, we developed pageless prototypes, pushed technology like Flash + Ajax and created human-centered “web applications”. But with the rapid and pervasive nature of Web 2.0 going mainstream—it’s becoming mandatory to be able to think and execute like this. Need proof? Take a look at this collection of thoughts + work from a recent grad of the IIT Institute of Design. Notice anything about how he approaches his work? He’s a “designer”, but aesthetics are only one small part of how he exercises his creativity. In fact, this brand of creativity is more like creative problem solving vs. the way many people still traditionally view creativity. And what about the teams? Aside from this evolved creative individual, what kind of team is needed to drive the next generation of communication, interaction and marketing engines? There’s not a clear answer to this question, but signs are heading toward smaller interdisciplinary teams composed of individuals possessing complimentary skill sets and overlapping talents. So where does this all go from here? If you feel like you fit the bill, you’re probably thinking about how marketable you are right now. And remember, we’re not talking about a “jack of all trades” here. “Creativity 2.E” is not about doing everything and learning every application under the sun. It’s about being curious, empathetic, analytical, insightful and expressive all at the same time. It’s about being willing to do anything to get into the heads of your customer/user. It’s about adopting new tools, techniques and artifacts to help make your case for creating the right kinds of communications, interactions and experiences. So what to do if you’re feeling left out? Resist the urge to become defensive and territorial—put that energy into developing an acute sense of curiosity and optimism. Become like a child. Participate in the emerging media. Start a blog, update your site or if you don’t have one—set it up. Dive into the digital social communities and be willing to do what your customers do. Try methodology that you might not ordinarily consider. PowerPoint isn’t just for presentations. Flash isn’t just for motion. Move past boxes, arrows, colors, layouts, charts, funnels, and metrics. 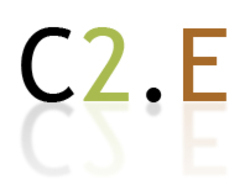 Creativity 2.E is both old and new—and like evolution, will continue to change and modify over time. The question is will we?